I want to do more yoga to gain flexibility. I want to try out new recipes at home at least once-a-month to eat more variety. 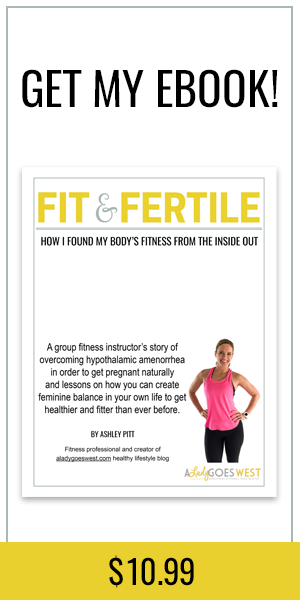 I want to learn to teach an additional group fitness class to add to my repertoire. I want to be more patient with myself and with others. What you may notice about these goals is that they are not appearance-based at all. They are feeling-based. All of these things will make me feel healthier from the inside out. In life, it’s usually not one single thing that is going to make or break how you feel, but a combination of many things that can add up to be just what you need to achieve wellness, like sleeping more, eating right, exercising and being kind to yourself and others. However, on top of that, sometimes there are things that can help you feel good that you may not be even be considering. Things like vitamins, folks, vitamins. These things, while seemingly unrelated, are all parts of how I live a healthy lifestyle. 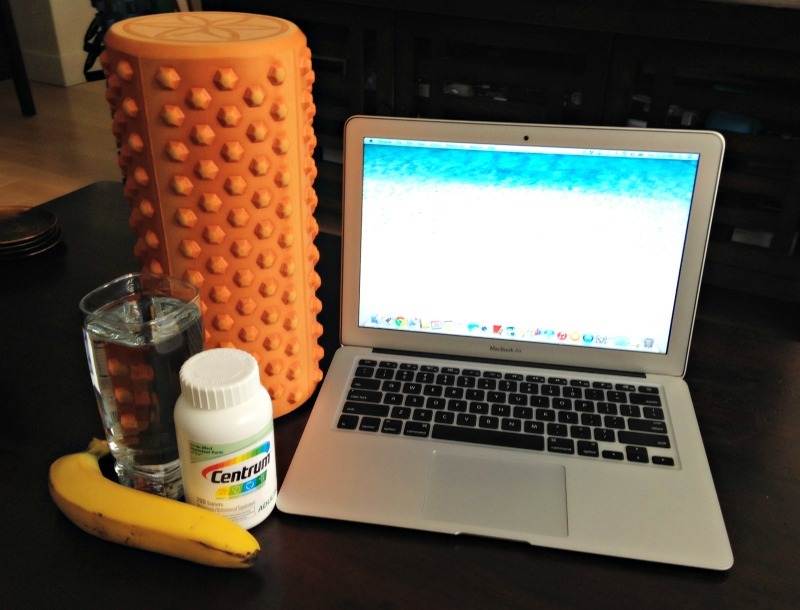 Fitness, hydration, real food, a daily multivitamin, and of course, a way to share my passions through blogging. That’s where it’s at. While clearly I’m not a doctor or a registered dietitian, I am someone who knows what works for me. I’ve been an avid daily multivitamin user for years and years. Even on vacation in Cabo, I bring along my multivitamins to take in the morning before a day of lounging by the pool. It’s part of my life. And I can’t remember the last time I went a day without a multivitamin. That being said, when the folks at Centrum reached out to me about some information from a survey they just conducted with Prevention, I felt compelled to share it with you. I’m a bit of a nerd when it comes to statistics and trends, so this one was interesting to me. And if it helps one person, then it’s worth it. Are you getting enough nutrients in your food? Here it is: It’s very possible that you aren’t getting the adequate amount of vitamins and minerals you need through food alone, even if you have a balanced diet, so a daily multivitamin might be the way to go. And you’re not alone. A lot of people aren’t getting enough nutrients, because it’s not that easy to track the nutritional content of every bite you take, especially when you lead a busy life. Do you know what the six essential nutrients are that most people aren’t getting enough of out of their food? I certainly didn’t. They are vitamins A, C, D, and E, and the minerals calcium and magnesium. Do you know if all of those nutrients are in the food you eat each day? I sure don’t. That’s why I like to rely on a multivitamin to make sure I’m capturing all that extra stuff that just might give me a little extra oomph. Most people (about 80 percent) said that the nutritional content of the food they buy factors into their purchasing decisions, but they were mostly concerned with calories and fat (about 72 and 61 percent, respectively), rather than the amount of vitamins and minerals in that food (about 30 percent). Magnesium is important for energy. 58% of people polled were “not sure” where they can find Magnesium, and only 8% were aware it is important for energy. Vitamin E is important for heart health. 53% of people polled were “not sure” where they can find Vitamin E, and only 12% were aware it is important for heart health. Vitamin A helps the immune system. 50% of people polled were “not sure” where they can find Vitamin A, and only 10% were aware it helps with immune system. So basically, if you’re like me and a bit clueless when it comes to what these nutrients are good for and why you need them, you’re not alone. But you don’t have to worry, because you can easily help fill any dietary gaps by taking a multivitamin each day. I’m a bit of a worrier, so knowing that I’m crossing “essential nutrient consumption” off the list of to-dos each day makes me feel a lot better. How do I do it? With routine. Every single morning, after I eat breakfast, I take my vitamins. I do it right before brushing my teeth. It’s just part of my morning process and keeps me honest. So there you go! That’s the one thing I’ve always done to be healthy, for as long as I can remember. 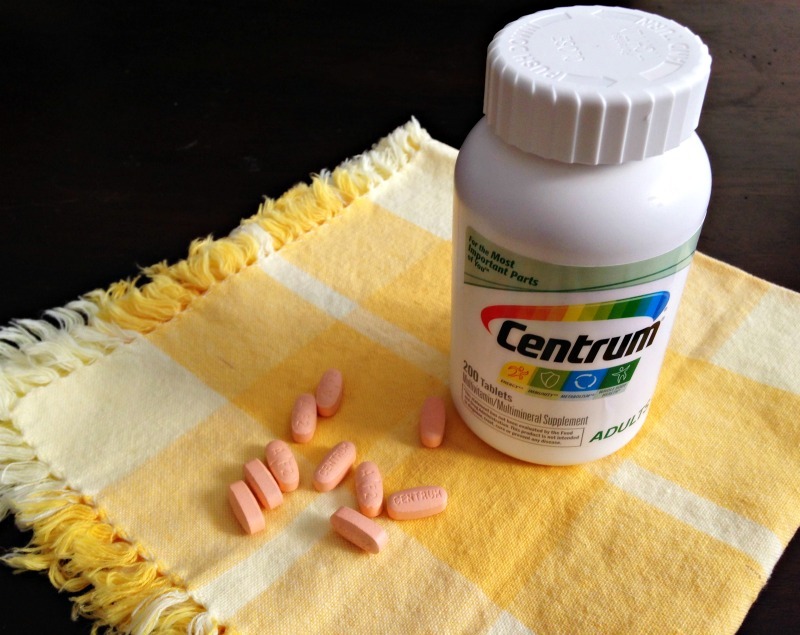 If you’re in need of a multivitamin, head on over to the Centrum site to find one that is right for you and take advantage of a $4 coupon off your next purchase. Centrum multivitamins have all of those essential nutrients I mentioned above in one little pill, so they make it easy for you. A look at my bottle of Centrum multivitamins, which are little and orange and full of good stuff. Thanks to the folks at Centrum for bringing this good information to my attention, because I’m definitely a believer in doing whatever you can to be your best self. Not only at the start of the year, when everyone is focused on being healthy, but all year long when the talk about “goals” and “resolutions” has faded. Am I right? Alright guys, I hope your week has been going along just nicely. I’m thinking of popping in later today to share an awesome workout with you. But if not, I’ll see you back here tomorrow morning for everybody’s most-anticipated post of the week “Friday Favorites.” Have a good one! Disclaimer: I am participating in a sponsored campaign hosted by Centrum®. I received compensation for this post. While all opinions stated are my own, I make no claims about Centrum® as a product or its effectiveness. Do you take a multivitamin? What’s one thing you’re trying to work on this year to be healthier? I’ve gotten out of the habit of taking a vitamin, but I really need to start again! I would like for it to be just part of my daily routine. One thing I’m working on to be healthier this year is hydration….I’m trying my best to drink at least half my body weight in ounces daily but aim for a gallon. I’ve always struggled with this for some reason, but I notice how much better I feel when I get my water in. Have a good day! I used to take a multi-vitamin and was as diligent as you about taking it. But now I get all the vitamins and minerals I need in my Shakeology! No more buying separate supplements for me because it’s all in there. One of the biggest reasons I love that stuff. Happy Thursday to you! I take womens organic multigrain by garden of Eden. One of the things I started doing when I became injured last year and was told I wasn’t getting enough calcium. I take a woman’s multi-vitamin by Garden of Eden. I agree that we do not get enough nutrients in our food (no matter how well we eat) and it’s important to at least take a multi on a daily basis. I’ve been on and off with taking multi-vitamins mostly because I don’t find they make a difference in how I feel. But I’ve also read about how the quality of the vitamin you’re taking makes a huge difference so maybe I wasn’t taking a quality one! I’ve been taking a high quality fish oil supplement lately and have noticed that makes a big difference in my workout recovery. Since being pregnant I have been taking my prenatal vitamins, but need to keep up on the vitamin train after the babies are here! Hi Jess! Thank you!! 🙂 Happy Thursday to you! Good call on taking vitamins! I used to be a lot better.. some days I just forget. But it’s such an easy way to get those nutrients in. I just get the Target brand women’s multi.. they’re very reasonably priced! I can specifically remember one day my freshman year of college.. the only things I consumed were cereal and alcohol.. but I took my multivitamin! 😉 haha. Even on days where I can’t get a workout in, I always make sure to drink enough water and take a multivitamin…all about routine! Heather @ Housewife Glamour recently posted…Do You Take a Multivitamin? I’m not a big supplement fan, I do take a B12 because I don’t eat meat or any animal products and ONCE in a blue moon I’ll take a multi vitamin. I also randomly take VitD&C. I try to ensure I eat a wide variety of plant based foods to get my nutrients. I will admit I don’t take it as seriously as I probably could. So funny Ashley, because I saw Centrum “chewables” and thought they would be yummy so I bought them..only to realize after a month of taking them that it said “for aging adults 50+”..ha! I have been taking SuperFood 6x a day, which has 55 organic veggies and fruits in it. I love them! Chloe – A Latte Lipstick recently posted…Let’s Talk Strength Training.